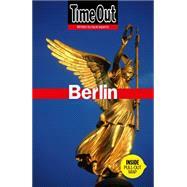 The tenth edition of Time Out Berlin covers all aspects of life in the capital city from festivals and nightlife to avant-garde arts. The home of over 150 museums and 50 theaters, Berlin attracts tourists all year long. The chaotic post-reunification a decade ago, gave rise to a vibrant subculture, as artists and bohemians flooded into the city from around Germany and the world. In the melting pot, fashion, photography, architecture, product design, music, parties all benefited and continue to thrive. All Time Out Guides are written by a team of local journalists.